It’s been quite a while since I’ve last posted a research update, so I think it’s time! My experimental prairie is still going strong and looks lovely with its fall colors. In early summer, my university’s Northwestern Magazine published an article about some of the doctoral candidates that are doing all kinds of interesting research. I was happy to have been included as a part of this article. You can check out a digital version of the story here. My experimental green roof trays have the same species growing as last year, even with my total neglect this past summer. Looks like I’ve discovered some low-maintenance native species! This past summer was the first one in eight years that I didn’t collect any new data. That was a strange feeling! I definitely had enough data to analyze, write about, and talk about so that’s what I did. I also took some time off to take care of a new little budding botanist in my life. Even in my absence, the prairie plants on the green roofs grew, flowered, made new seeds, and generally carried on just fine. After a few months, I was surprised to see that some of my experimental plots looked almost exactly like they did a year ago. This speaks to some of the low-maintenance requirements of both green roofs and native gardens. Although I wouldn’t recommend just planting things and walking away, it’s nice to think that some of my experiments might still be growing strong for years to come. These native grasses weren’t part of my experiment but are really cool to see. Planted on a green roof in 2009, the grasses are now taller than me! I was happy to present my research in Seattle, WA. Since starting work again this fall, I’ve given presentations about my research both locally and out of state. My first presentation was at the Green Roofs for Healthy Cities annual conference in Seattle. At this conference, I talked about my experiments measuring ecosystem services provided by green roofs. Ecosystem services are benefits that people get from the natural environment, like clean air and water. The research that I presented found that native plants on green roofs are very good at providing the ecosystem service of stormwater retention. Local grasses and wildflowers can absorb a lot of rainwater – more than some non-native succulent species – which helps keep storm systems in cities from getting overburdened and overflowing sewage (obviously a good thing!). On a different note, I also gave a presentation about the benefits of pollinators at the Garfield Park Conservatory in Chicago. Even though Chicago is my hometown, it was my first time visiting this beautiful greenhouse. If you’re a local, you should definitely check it out! There is a green roof right by the Space Needle in Seattle (above and to the right of my head). Writing has been my main task these past few months. I’m excited that I finally got the proof for a manuscript that has been accepted for publication. This publication discusses some research I conducted in Germany back in 2013, which found that plant communities on green roofs don’t all follow the same pattern of succession. I submitted this manuscript back in the beginning of 2016 so it’s very nice to see it in the final stages of publication after 2 years. It’s still not officially out yet, but I think it’s getting close. At least, I really hope so! Aside from this publication, the majority of my writing was to complete the revisions on my dissertation. I’m very happy to say that the revisions are now all completed. The best part of completed revisions means that I got to submit my dissertation! Yes, it is officially done and I am just one final presentation away from finishing my PhD. After so many years, this is a strange and wonderful feeling. I’m hoping to write a special blog post in the future about my reflections on this time and some lessons learned so as to be helpful to future botanists who are traveling on a similar path. My future botanist and I celebrate the submission of my dissertation to Northwestern University! This coming winter will bring the end of my graduate studies and hopefully some exciting new professional opportunities to continue teaching and learning about botany in the Chicago region. As I take a pause from the fast-paced research of graduate school for a little bit, my research updates on this blog may be less frequent. But my botany in action isn’t over! I’m looking forward to finding new ways to share botany with you all! May is over and summer is officially here! In the past, this has meant that it’s time for me to get up on the green roofs and start collecting data again. But not this year. Penstemon hirsutus or “hairy beardtongue,” is one of the species that I am studying for my dissertation. It started blooming on a green roof by the end of May. My research found that although the genetic diversity of this population is not very high, the flowers still get visited by a lot of pollinators. Pollinator visits can help keep genetic diversity from becoming too low – this is a good sign for the Penstemon. This past May, my research schedule was a bit different because I have been busy trying to finish analyzing my data and writing up my results. I’m in the processes of finishing my Ph.D. and wanted to defend my dissertation by the end of the month. So instead of collecting new data, I looked at what I had already gathered and worked hard on uncovering the story that the data had to tell. I’m happy to say that by the end of the month I had written a story of how green roofs could be used for conservation of native plants. I then presented the nearly 200 pages of information to my defense committee in a 30-minute oral presentation and they asked me questions about my research for about 3 hours. All in all, it was a long process, but it was also very exciting to be able to look back at all the research that I’ve done over the past 6 years and finally be able to say that I have some conclusions and recommendations. The committee decided that I passed this test, which was excellent news! I still have some revisions that I need to incorporate into my overall dissertation and then I’ll continue working on getting my research published in peer-reviewed journals. This will take some time. But I’ll have all the revisions done so I get to be called “Dr.” this year, which was my goal. As I transition from research for my dissertation to a new career path, there is no new research or data collection. In fact, I’ll be taking some time off this summer from both the research and the blog posts. I’m sure it will be strange not visiting some of the green roofs that I’ve been going to year after year. But I’m also sure that I’ll enjoy some of the cooler temperatures on the ground when the sun is really beating down on the hot, hot rooftops. After tending to some of my sites for 4 years now, it’s time to see what they do on their own. Happy summer to all! Go visit a green roof this season. I’ll talk to you again in September! My green roof plots at the Chicago Botanic Garden continue to grow and are looking good to start their fifth summer season. Without monitoring or data collection this year, it will be interesting to see how they do. Good luck my little plants! Prairie smoke (Geum triflorum) is one of the first plants that blooms in the spring. It was flowering on this green roof in Chicago among the short leaves of other native plants. This rooftop will look like a fully-functioning prairie in a couple months! Welcome spring! It’s time for the plants on the green roof to wake up from their dormancy and start growing once again. 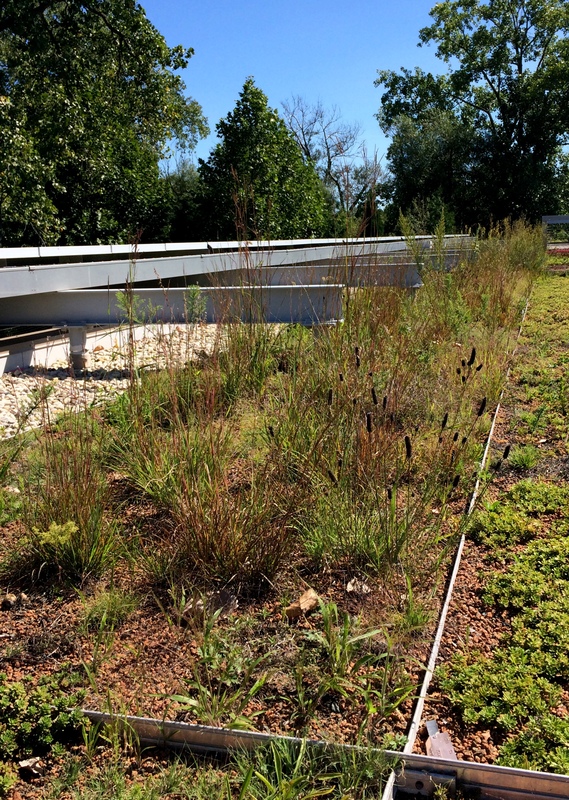 It’s wonderful to see that some of the native prairie species that I planted back in 2012-2014 are still alive and doing well on the green roofs around Chicago. Though most of them are still tiny, I think they’ve been enjoying the milder temperatures and lots of rain. By mid-summer, things will look quite different! 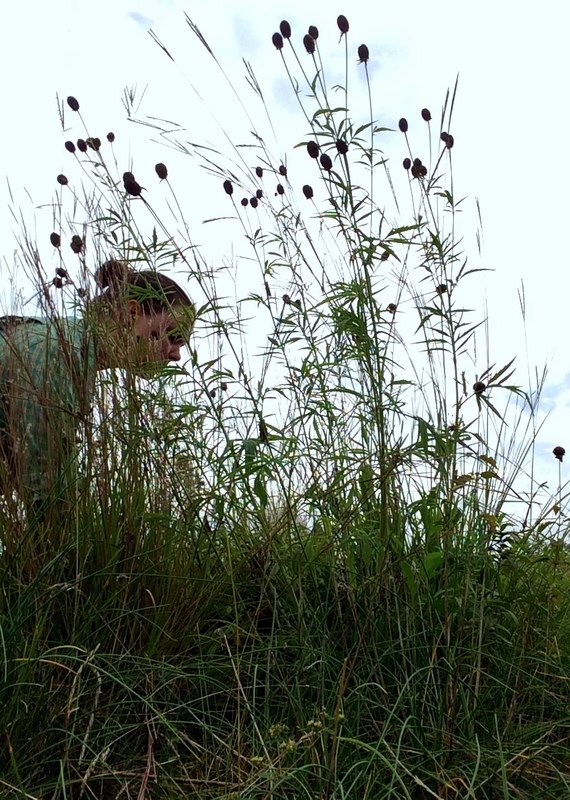 Even though I’m not collecting data this year, my experimental prairies are still going strong on the green roofs. You can see the plants starting to emerge in the strip along the lower right corner of the photo. I’m finished collecting data on the green roofs for now and these past months I’ve mostly been analyzing my data to see what patterns emerge and writing about my results. I’ll be finishing my graduate program this year and I’ve got enough data to write about for my dissertation. It already feels a bit strange not to go back to some of the same green roof sites that I’ve been visiting year after year, but I’m sure that my post-graduation plans will involve green roofs in some way so I know I won’t be away for too long. It’s also kind of nice to just go to the green roofs and appreciate their beauty without all the strenuous data collection! For part of a virtual conference, I filmed myself talking about my children’s activity book “Growing UP in the City: A Book About Green Roofs.” The video was featured during the month of April. Other than data analysis and writing, I was also involved in a conference this spring. Not a typical conference this time, but a “virtual summit” which is a type of conference that is 100% online. It’s the first time I’ve ever been a presenter at a virtual conference and it was quite a different experience. I was invited by greenroofs.com to speak about the children’s activity book I wrote for their 2017 Green Roofs and Wall of the World 2017 Virtual Summit. Being a speaker involved writing a script, videotaping myself, and collecting video clips and photos of people using the book. Thankfully, the organizers of the conference helped produce a nice video. Now people who are registered for the summit can watch it online to learn all about how and why my coauthor and I designed this fun book. There was also a live question and answer session about the book, which is similar to the Q&A sessions at the end of regular presentations in live conferences. All in all, this virtual presentation was a neat way to talk about some of my work with people from around the world. And I didn’t even have to leave my house! Back in August, I was filmed for the video series, Urban Nature. In March 2017, the video was released. Check it out! Speaking of videos, in March WTTW Chicago put out the video series for which I was filmed back in August. The series of videos are all about urban nature and they include a lot of really interesting stories! The one I’m in is called Rooftop Refuges and you can watch it by clicking here. It starts off in New York where researchers are looking at how birds use green roofs. My part about native plants ended up being pretty short, considering the hours of filming (and extreme sweating in over 100 degrees F heat), but I think it came out very well. Be sure to take a look – I’m sure you’ll learn something new! There is also a short article about the video series that you can read by clicking here. Enjoy! Just a quick update here for February. Although we got no snow cover (no February snow in Chicago – can you believe it? I wonder how the green roof plants will do after this unusually warm winter!) it was still a good time to get some indoor work done. This past month, that meant more writing and lab work. Which offspring do I have enough genetic data for? Color-coded charts help me figure out which samples I need to run next in the lab. My February writing mostly focused on a manuscript I’m writing about the different types of plants that survive on green roofs over long periods of time. I used some long-term plant surveys of 6 green roofs in Germany and included a plant survey I conducted on 13 green roofs in the same region when I was there back in 2013. While I was writing, I was also analyzing the collected data to see if the types of plants that arrive on green roofs right after their planted are different than those that end up staying there for a long time. I did find some differences. It turns out that weedy plants able to spread seeds and easily use resources like water and soil nutrients are common on green roofs for a few years after they are built. But later, only the species that have traits that make them tough enough to withstand the heat and drought on green roofs will remain. It took a long time to figure this out and write up the manuscript. I now have a draft. I’ll keep working on this manuscript and will hopefully be able to submit it to a journal for publication review sometime this spring. 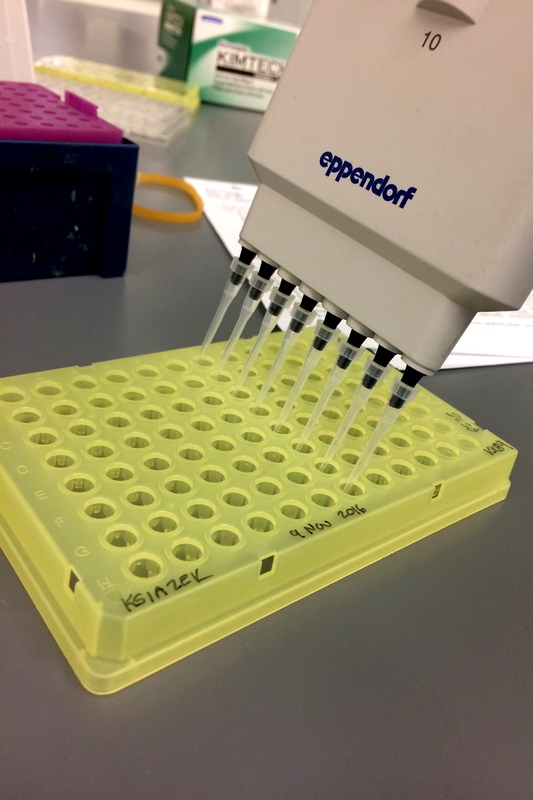 More little test tubes of DNA and more genetic sequencing in the lab. I’m getting more data every month but still have more to collect. In between writing, I also got in a little bit of work in the genetics lab. I’m still trying to figure out how much genetic diversity the plants on the green roofs have. When I have some more data, I’ll figure out if this is similar to plants that have been living on the ground for a long time. I’m hypothesizing that the plants on the green roofs don’t have as much genetic diversity because there are fewer pollinators there so the plants that can breed with themselves, do. I’ve been collecting the data for this experiment for a while now. I think I’m getting closer but will still be spending more time over the next month or two working with machines in the lab that help me make copies of my plants’ DNA and then determine their genetic sequences. Other than the writing and lab work, I did get to present some of my work at a local conference in February. The Chicagoland conference was called WildThings and brought together over 1,000 people from the area who are interested in conserving the wild plants, animals, and other critters that we share our space with. The presentation went well and the presentations that I got to see were very interesting too. I especially liked learning more about conservation efforts that are happening in the corner of the world that I call home. Next month: more writing and lab work! Happy New Year and welcome to year #6 of my research blog. I think it’s going to be an interesting but different year as I transition from conducting research as a graduate student scientist to… well, a regular scientist! For one thing, I won’t have any of the typical field work during the summer that I’ve always had in the past. I’m sure I’ll still get out on the green roofs now and then but just without all the data collection. Instead, I’ll be doing a lot more data analysis to determine what all of my past data mean and I’ll be writing a lot about my conclusions. That, and applying for a new job where I can continue to do even more research in the future! A new year means it’s time to clean out old samples from the freezer and make way for the new ones. Say goodbye to thousands and thousands of little bits of now useless DNA. In January, although the plants on the green roofs weren’t covered in snow for even a single day (in Chicago – can you believe it? ), I still spent all my research time indoors. I spent most of my time writing. 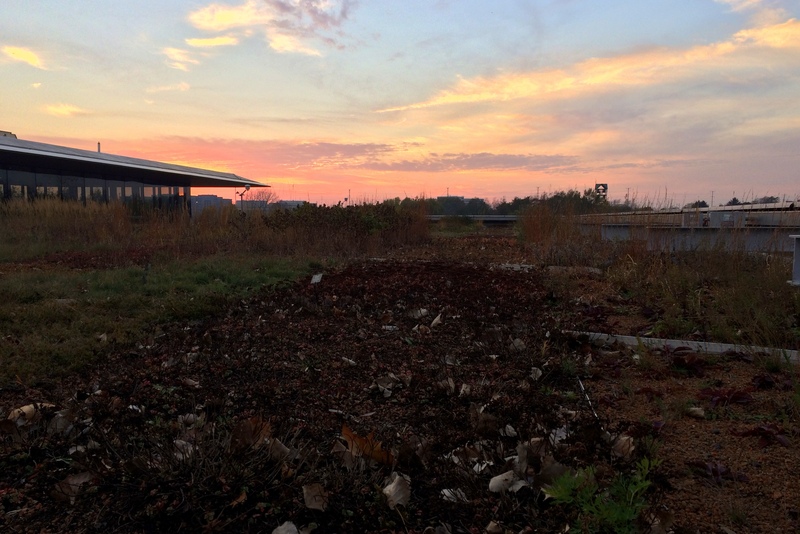 Specifically, I worked on manuscript revisions for an article I’m writing about the data I collected on the green roofs in Germany back in 2013. After writing this article last summer and submitting it to a journal for review, I received comments back from the scientist reviewers. I needed to make a lot of little changes and a few big ones before the journal would consider publishing it in a special issue about green roof ecology. It was a lot of work to complete all the changes and defend some of my methods to the reviewers, but I’m happy to say that all the effort was worth it and the manuscript has been accepted for publication! Now I wait for the editorial process to continue. I hope the special issue of the journal is complete and published by this spring. It seems like these things can sometimes take a very long time. Aside from the manuscript revisions, I’ve also been writing little sections of four other manuscripts that I have yet to finish and submit. Each of these papers is a chapter of my dissertation. They are all in various stages of completeness. When I decided to become a botanist I didn’t realize just how much writing was involved. Now I have to set reminders on my watch just to remember to get up from my desk and take writing breaks every couple hours. It’s a different kind of work from the data collection but it really helps me solidify my thoughts and explain the results of my experiments. I’m looking forward to meeting my weekly writing goals and completing more manuscripts in the future. 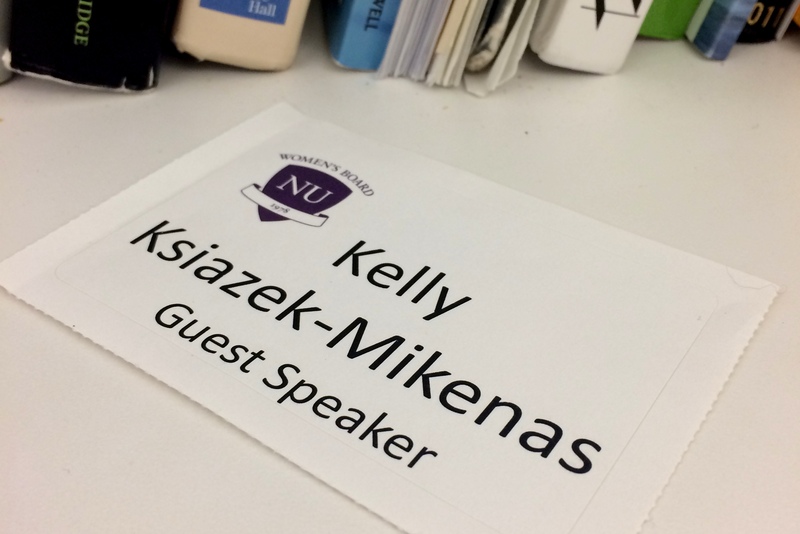 I was one of the keynote speakers at the dinner for the Presidential Fellows at Northwestern University in January. 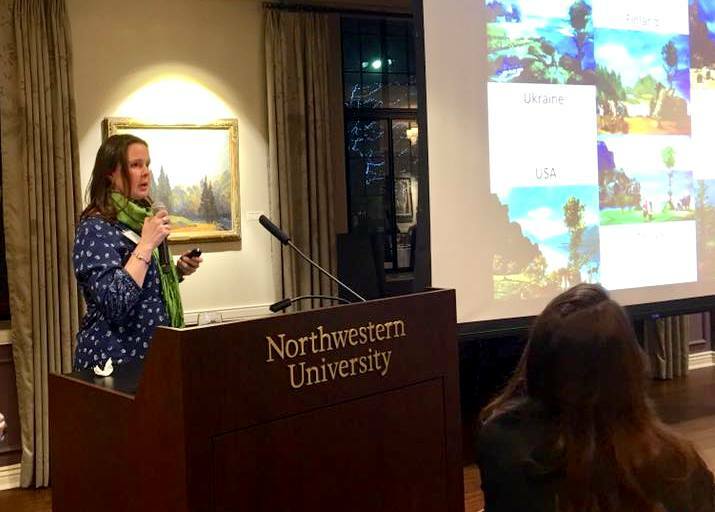 In the middle of the month, I took a break from writing to prepare and give a presentation at a dinner held for the Presidential Fellows at Northwestern University. This group of scholars comes from all of the departments in the graduate school so the audience has a wide variety of backgrounds; both science and non-science. It’s a different kind of presentation to give because I needed to talk about the merits of my research but in a way that anyone could understand. It was a little nerve-wracking but it went very well and I’m glad it’s over! It worked! 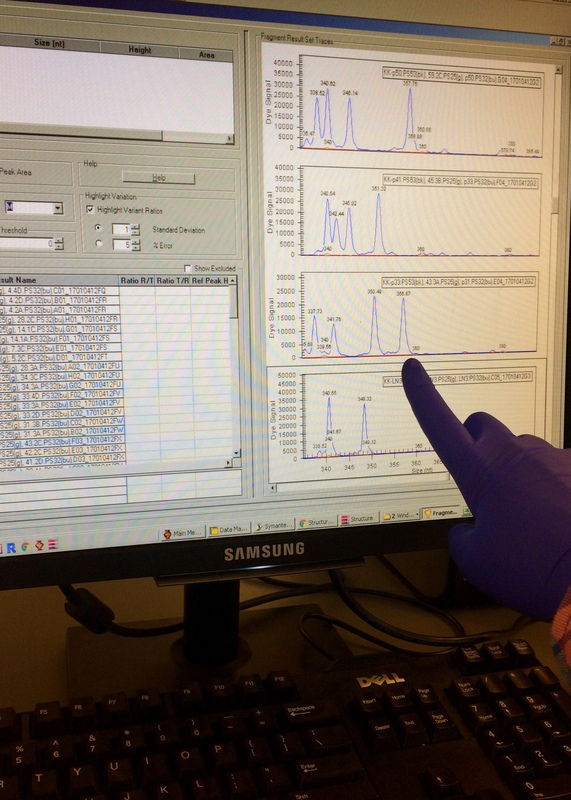 I look at the height of some blue peaks on the computer screen that help me determine the genetic makeup of all my plant samples. It feels so good when all the machines work and I actually get some data. And finally, January was also filled with some lab work. (No surprise there!) 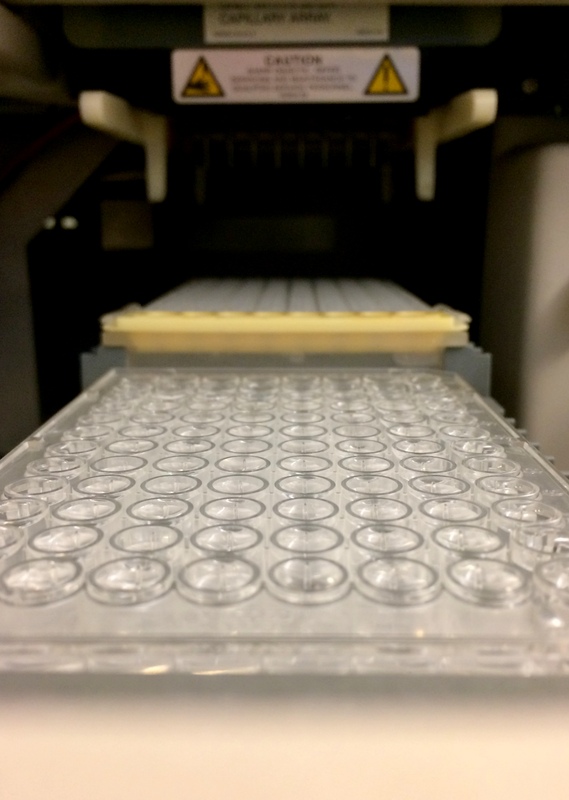 I’ve been having some troubles getting some of the equipment to work so in January, I re-ran a lot of my samples through the genetic sequencing machine. I never have 100% success but I was able to collect a little more data for some of my samples. Over the next couple months, I’ll keep trying to get a little bit more and a little bit more but by the end of March I think I’ll just have to make do with what I have. Hopefully next month I’ll have some good news to report on this part of my research. Fingers crossed! 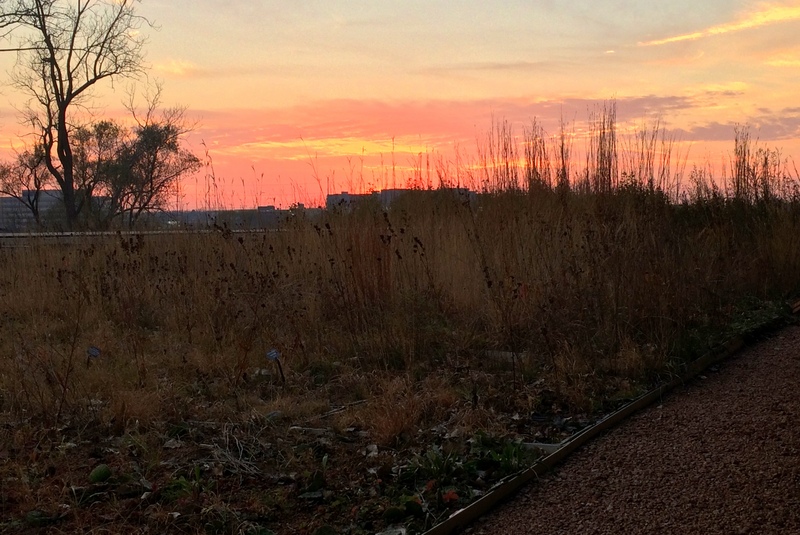 The fall sun sets over the dormant plants on a green roof. See you next spring, plants! In my previous post, I started by saying that I was gearing up for a winter of lab work, data analysis, and writing. In between holiday gatherings and celebrations (GO CUBS! ), my work predictions for November and December were pretty accurate. 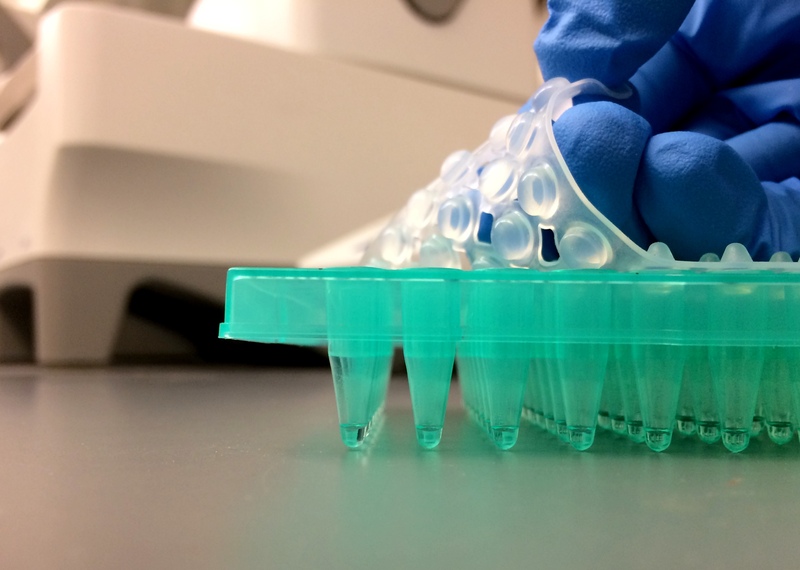 I remove the sealed top from my tray of samples after the DNA has been copied. It may not look like a lot of liquid in there, but there are thousands of copies of DNA! I drop oil on top of my samples in the little wells before running the final step of my paternity experiment. Then I cross my fingers that everything works this time. A renewed focus on lab work was my biggest priority over the past two months. I’ve been having a difficult time collecting all the data I need for this portion of my research due to a variety of factors including bad reagents (chemicals), low DNA quantities, low genetic diversity in my samples, faulty equipment, running out of supplies, dwindling research funding, possibly some unknown errors on my part and maybe even just some bad luck. (The lab manager also suggested that gremlins might be coming into the lab at night to mess with my experiments… at this point, is anything possible? Who knows!) So I’ve been fighting the good fight and filling in the missing data a little bit at a time. Sometimes it feels like I’m putting together a 1000 piece puzzle one piece at a time. It’s very arduous and I don’t know what the finished product will look like but I’m getting there and can’t wait to see the final results! 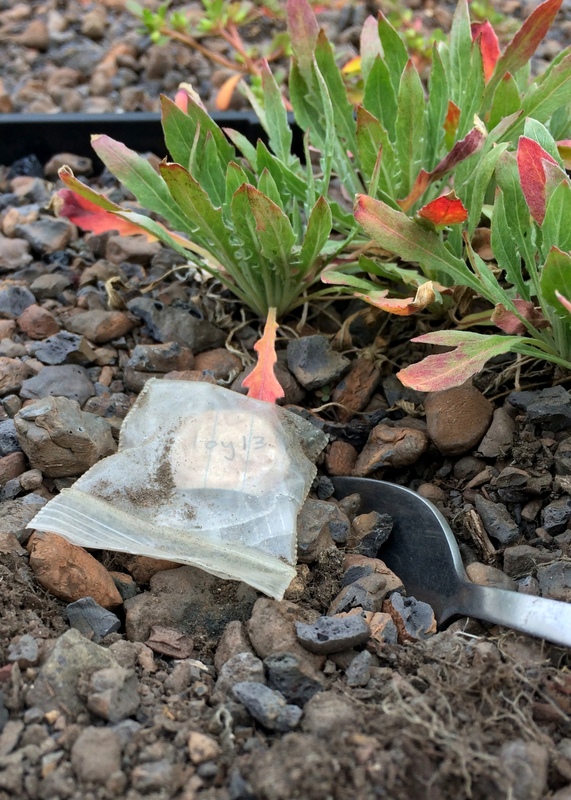 In the meantime, I’ll keep on extracting more DNA, amplifying or making copies of the DNA, conducting the paternity tests, and looking for patterns of genetic diversity in the plant populations on my green roofs. You’ll no doubt hear more about these tasks during the next update. 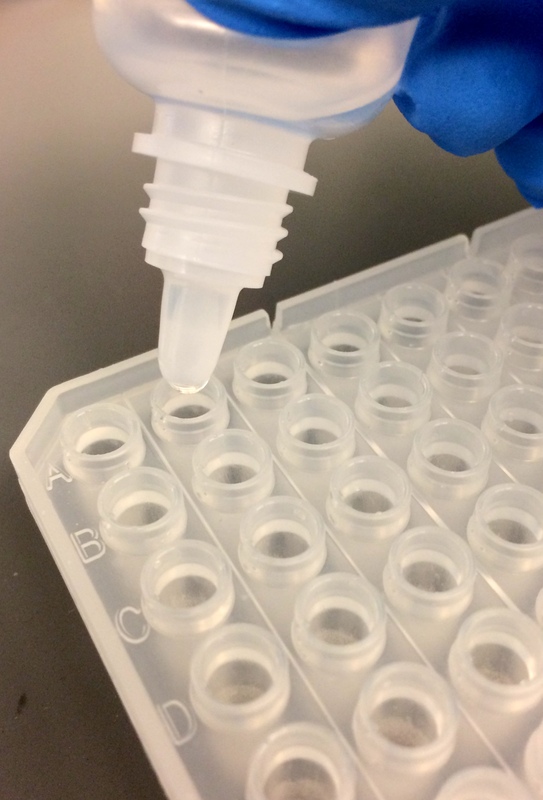 I use this helpful pipette to transfer multiple samples at a time as I load the next yellow plate for DNA copying. Lots of the lab procedures are repeated over and over again. This is what it looks like when you wait too long to collect your soil samples from your green roof experiment and have to do it when it’s really cold outside! When I needed a mental break from the lab work, I mostly kept busy indoors. 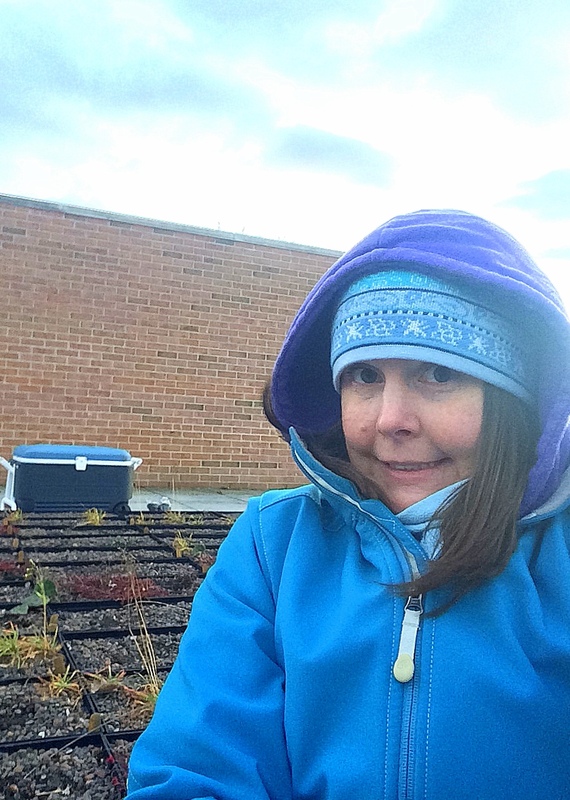 There was one chilly day that I spent on a green roof collecting some soil samples for a later analysis in the lab. I could have collected the soil back in October when temperatures were still balmy but this task slipped my mind and I ended up getting the job done on a very windy cold November day when the wind chill was about 20 degrees F (that’s about -7 degrees C). At least it wasn’t snowing yet! Other than that, I spent a lot of time analyzing the data that I’ve been collecting from the green roofs over the past few years and starting to interpret the patterns that I’m seeing. After having some initial data interpretations, I spent two weeks in December in a dissertation boot camp. This boot camp is a quiet place for doctoral candidates like me to really focus on writing about their research. It’s a great way to get some encouragement from peers to accomplish some writing before taking a little holiday break. 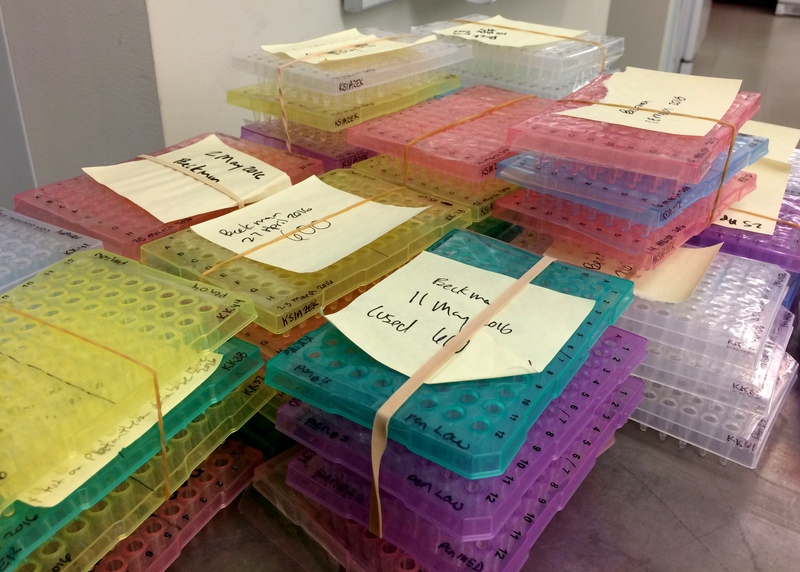 Another set of 96 samples is loaded up and ready to be processed in the DNA sequencing machine. This is the step in the paternity test where I determine each sample’s genetic fingerprint… if it works correctly. As the year came to an end, so did my mentoring with the PlantingScience project. This program matches up thousands of students with plant science mentors from all around the country. As a liaison and scientist mentor for the project, I helped high school students and their teachers learn about “The Power of Sunlight,” or how plants perform photosynthesis. As a previous high school teacher myself, it was great to get to interact with this group of students and see how the teachers were using technology to introduce students to a diverse group of scientists. Who knows, maybe some of these students are now budding plant scientists! Dried leaves rest among the last sprigs of green on top of a green roof at the Chicago Botanic Garden. Snow is coming soon! 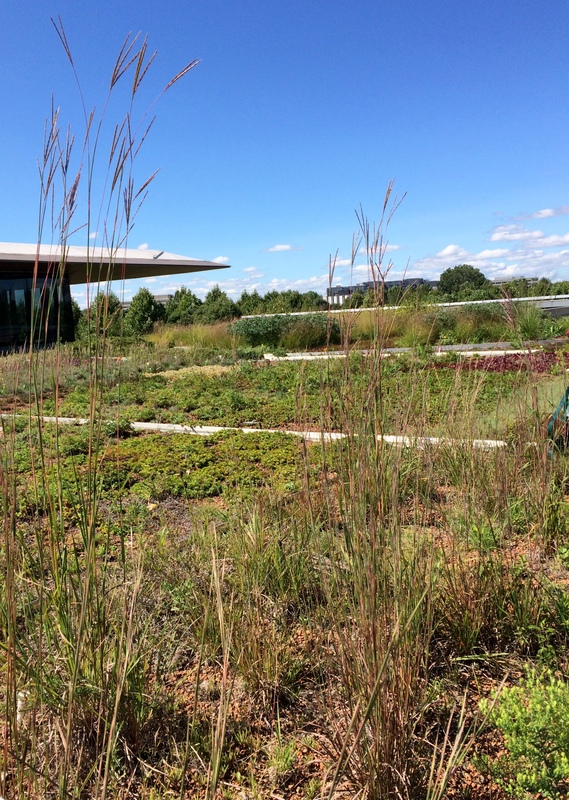 The prairie grasses are in flower on the green roofs – it must be fall! Fall is here once again and the plants on the green roofs are getting ready to face another tough winter. I, on the other hand, am getting ready to face a winter of lab work, data analysis, and writing. I’m happy to say that over the past couple months I’ve finished collecting all my data from my outdoor green roof experiments. After carrying out some experiments for 4 years, it was kind of bitter-sweet to see this step come to an end. 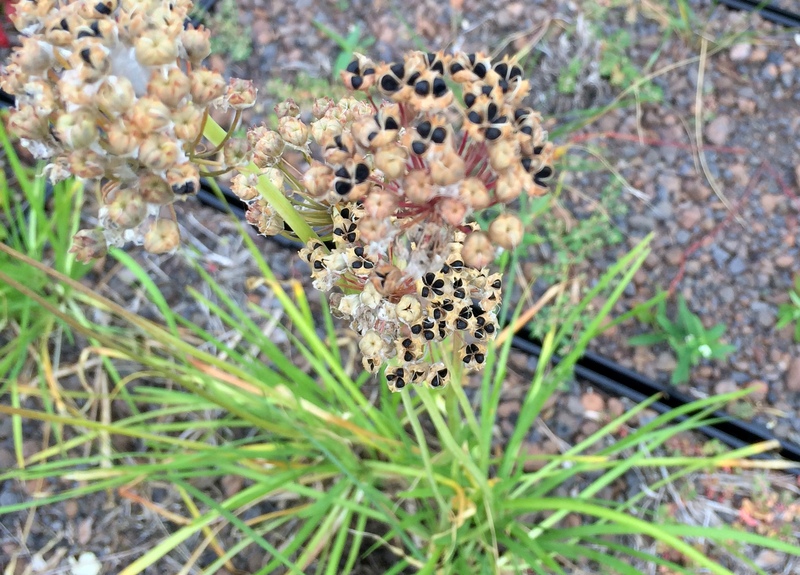 The nodding onion plants that had pollinators on them last month are now bursting with seeds. I can’t wait to see if there are lots of new seedlings next year! I finished collecting all of my temperature probes in September. 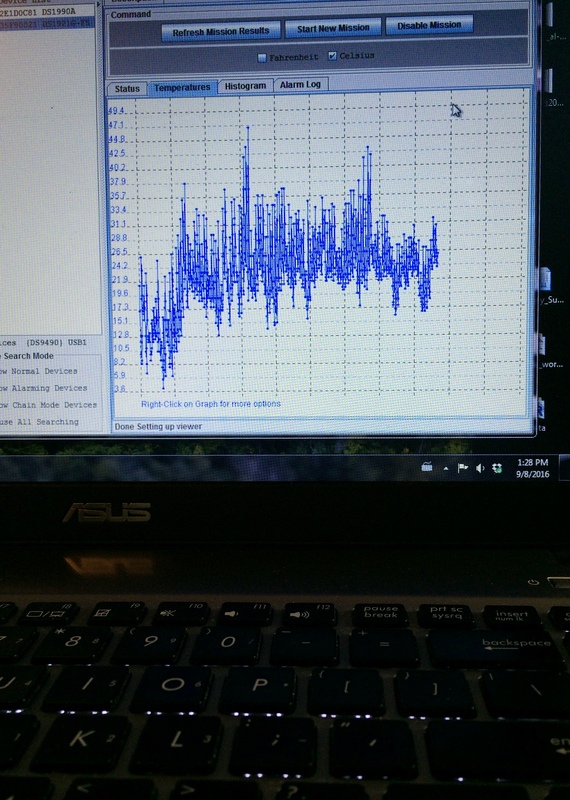 I’ve collected a lot of temperature data from the green roofs over the past 2 years. Now I’m trying to make sense of the trends that I’ve found. In September, I collected all of the remaining temperature probes from my plots. This was a little tricky in some plots where the vegetation is now almost 5 feet tall! I compiled all the data, which was actually a big task – I’ve been recording temperature every 3 hours for over 2 years on over 60 probes.I’ve started to look at trends in these data and so far it looks like there is little difference between my different treatments in the winter but larger differences between the native prairie plants and the non-native succulent sedum plants during the summer. As you might expect, the succulent plants provide more cover and shade, so they tend to keep the soil cooler than the soil that’s exposed to the full-sun conditions. I’ll spend more time analyzing these data over the winter and will be writing my conclusions in my dissertation this spring. Finding the temperature probes – only about the size of a dime – was a little tough in some of my plots where the vegetation was so tall. Eventually, I found them all! I’m growing quite a collection of name tags from guest lectures and speaker events. It’s always fun to talk to people about my research. I was also invited to give a couple guest-lectures in October, including at an Economic Botany class at the Morton Arboretum and during a tour of the Chicago Botanic Garden by the Northwestern University Women’s Board. It’s always fun to teach people about green roofs, urban ecology, and the unique opportunities I have as a graduate researcher in a joint program between two remarkable institutions. 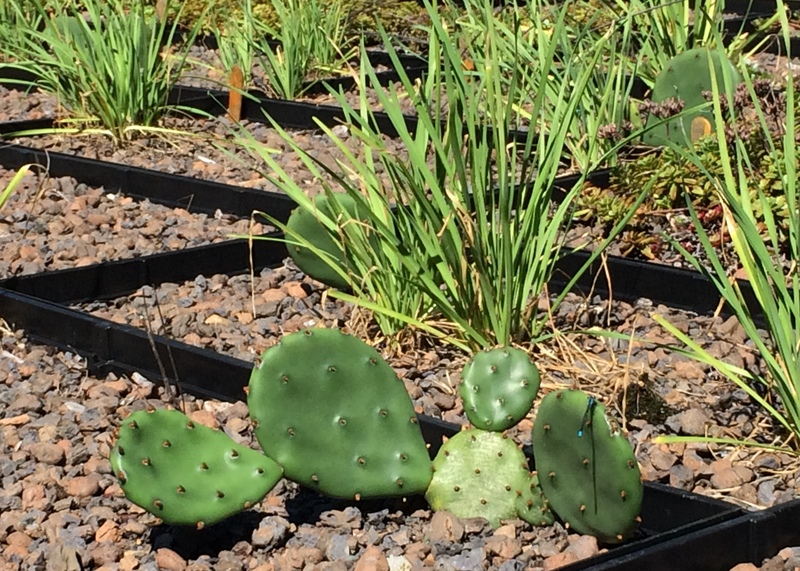 The prickly pear cactus is one of the only native species that survived two harsh years in the green roof trays. Fall has arrived on the green roofs! I’m happy that my research plots are really starting to look like prairies. Other than finishing field work and guest lectures, I’ve mostly been organizing and analyzing data, mentoring students in an online program called Planting Science, preparing job applications, and getting lab work done (when all the equipment has been working… which seems to be a rare event). I finished extracting the DNA from all of my samples and have very slowly been making progress with my paternity study. I’m hoping that next month will be a big one for lab work success. I’ve got my fingers crossed! 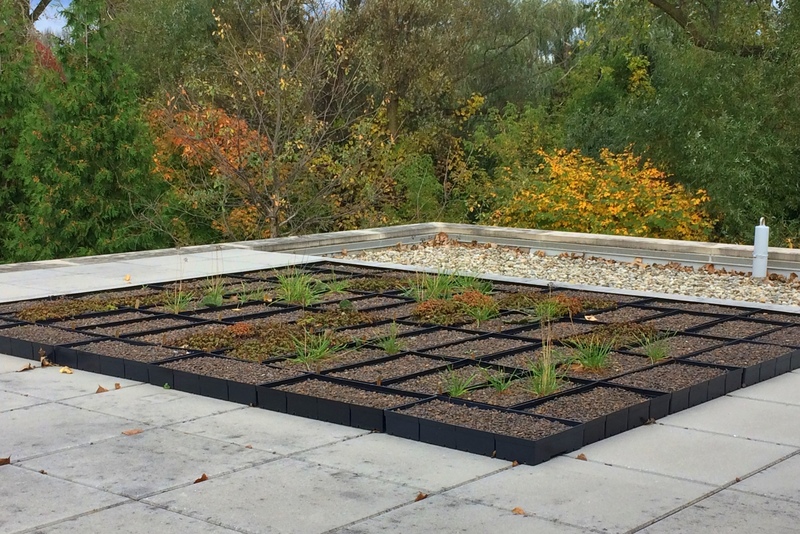 The green roof trays are ready for another winter as the colors of fall creep in. 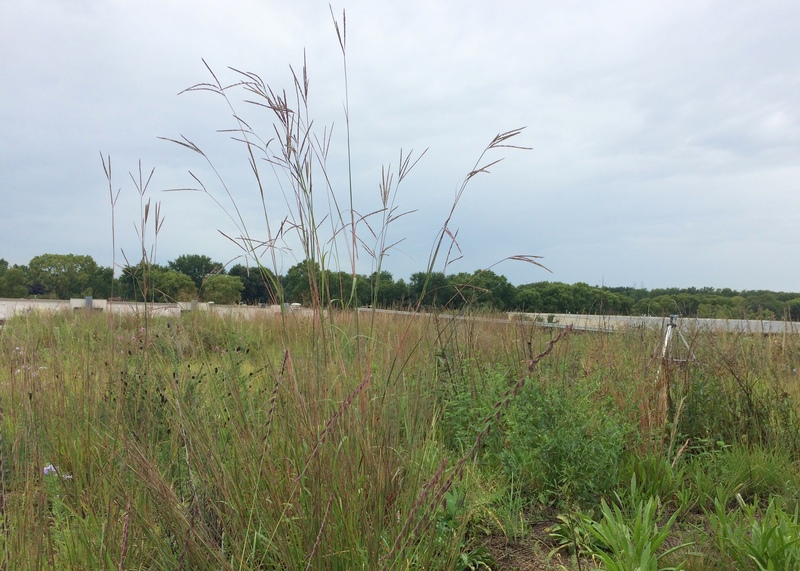 Big bluestem grass is flowering in my green roof plots. See you next spring, prairie plants! Finally, I’ve been working on writing a short article about a unique plant that found its way to a green roof in London. The story should be published next month – stay tuned!